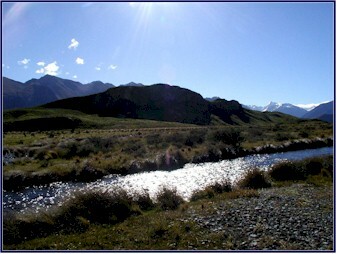 Born high up in the Southern Alps, the Rangitata River is fed by snowmelt tributaries. 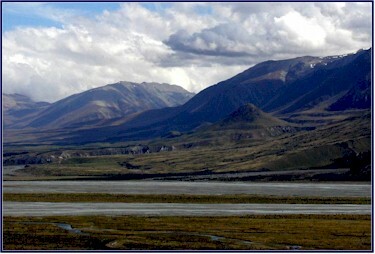 Lofty mountains create a spectacular backdrop for this wide valley, with its broad rocky flats and the braided river weaving through it. 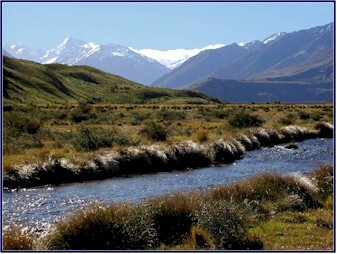 Actually, two rivers come together in this valley, the Rangitata River and the Potts River; and between them, formed by ancient glaciers, sits Mt. Sunday, rising abruptly from the otherwise flat plain. 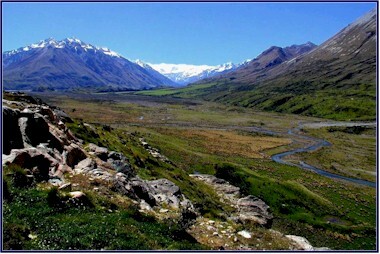 The valley is called Erewhon, and it is 85 kilometers from the nearest town. We stood on the hill and the whole valley was laid out before us. From our high vantage point we could see far up the riverbed, to where it disappeared between snowcapped mountains. And out on the valley floor far below us stood Mt. 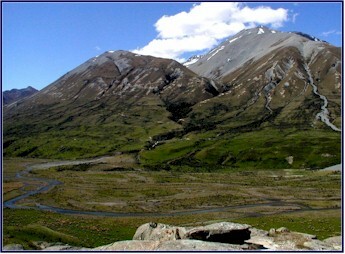 Sunday, the hill which portrays Edoras, home of the horse lords, the Rohan people, in the “Lord of the Rings” movies. It looked tiny in contrast to the towering mountains behind it; but it was unmistakable! Although we hadn’t expected to visit as many filming sites as we ended up doing, this was the one LOTR movie location that we had really wanted to see from the beginning. 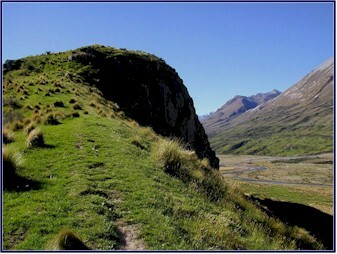 We descended into the valley, and as we got closer to Edoras it loomed larger. It was a high green hill with steep rocky faces; and from here we could see it was quite big, though still small in comparison to the high mountains beyond. It looked just like it did in the movies, even though the Golden Hall was now gone; you could almost see Gandalf, Legolas, Gimli and Aragorn riding up the grassy slope. Now to find a way to get to it! There was a rough jeep track that headed across the shingle of the riverbed towards the hill, but there was a locked gate across it. We parked our car and planned to hike in. We weren’t sure if we were allowed to go there, but with our binoculars we could see the small shapes of several people on the top of the hill; we figured if they could do it then we could too. We packed our lunch and our wine into the backpack and set out for Edoras. This proved easier said than done! We climbed the fence and started out along the jeep track; but we could see that it went far down the valley before curving back towards the hill, so we decided to take the shorter route straight across the rocky riverbed. Soon however, we came to a swiftly flowing stream, about knee deep. We took off our hiking boots and socks, rolled up our pants, and carefully waded across. The water was icy cold, and the rocks under our bare feet were sharp and painful. Once across, we dried our feet, put our socks and boots back on, and continued; only to come to another stream blocking our way almost immediately! Boots and socks off again! We repeated the entire process three more times, with the rocks cutting into our bare feet more painfully with each crossing. Presently we saw some people approaching; it was a man with two children, the people we had seen up on Mt. Sunday. Great, we thought, if they could get there, so could we! The kids were wearing flip-flops, which seemed incredibly sensible for the stream crossings though not too practical for the rest of the tramp; but we noticed that the man was in hiking boots, and that they were completely soaked! This was not a good sign. Finally we came to the last crossing; but it proved too swift and deep to safely go across barefoot. We took off the boots and tried, but with the sharp rocks making it impossible to walk sure-footedly, we felt like we might be swept away. While we were there contemplating what to do next, another hiker appeared, a man returning from the hill; he took off his hiking boots and pulled flip-flops out of his backpack, and waded across the thigh-deep water. Flip-flops in the backpack! Why hadn’t we thought of that? We felt that he was exceedingly clever, until we noticed that he actually only had one flip-flop rather than a pair, and he told us that he had just found it! Though he made it across, it looked treacherous; after much speculation and several aborted attempts, we decided to go back to the jeep road (which of course meant re-crossing the streams that we had already come across) and go the long way around. We were really determined to get to Edoras! We really, really wanted to get up onto that hill! Finally, in frustration, we said the hell with keeping our feet dry and just tramped through the stream with our boots on, the water well above our knees. We probably would have done this much sooner, but we were reluctant because we both had brand new hiking boots for this trip. But once we had doused our beloved footwear, it did bring a certain level of freedom to not have to worry about keeping our feet dry. And that was just as well, because while following that jeep road we ended up crossing 7 fords! Eventually we made our way across the riverbed and started up the slopes of Mt. Sunday. The front side of it is sheer and steep, with rocky cliffs rising sharply out of the plain; but at both ends were grassy slopes that could be walked up, the climb was sharp but not too long. We passed several cows on the way up; we asked them where they had been when we needed a ride across the river! They didn’t answer, nor did they volunteer their services for the return trip. When we reached the top and stood on the rock outcropping on the summit, we were high above the plain with an incredible panoramic view 360 degrees around us. The sun was shining and the sky was a crystal clear blue, and a stiff breeze was blowing. Snow capped mountains formed the margins of our world, as the wide Rangitata River flowed lazily below us on one side, and the many-channeled Potts River, which we had crossed, wove its way down the valley on the other. The views from the top were familiar from the movies, but film couldn’t do them justice; they were so much more spectacular in real life. Being on top of Edoras was pure magic. It was very peaceful, and the solitude was complete. We sat on the rocks in the sunshine, right on the spot where the steps of the Golden Hall had been; but all signs of the buildings from the movie had been completely removed, and the hill was as nature made it. All we could hear was the wind, the bird songs, and the occasional sheep or cow. The air smelled sweet. It was a special spot, a place of imagination and inspiration. Life cannot offer many places that are finer; it was wonderful to just sit there quiet. Don’t think, just be. You know how sometimes you go to a new place, and you feel like its familiar, like you’ve been there before? Well, I felt I had NEVER been anywhere like this place before! But I had a very strong sense of connection with this place, as if I had always been meant to go there. Like I belonged there. We had lunch at Edoras. We opened the wine, and Jineen made a toast: “To Peter Jackson (director of LOTR), and to this wonderful place that we probably would never have come to if he hadn’t found it first!” We ate our lunch, drank the wine, and explored the hilltop. A piece of red rock from the top of it joined the green and white stones in my pocket. The wind was gradually picking up force, but the temperature remained pleasant. We pulled out the binoculars and amused ourselves by watching two hikers far below us who were trying to cross the riverbed as we had done; we supplied commentary at each attempted stream crossing and backtracking! We spent the whole afternoon up there. The wind grew stronger and stronger; after a while it was nearly blowing us off the hilltop. I loved the feeling of standing on the top of the cliff (not too near the edge! ), facing into the wind and feeling it strong in my face. I felt like I could fly! I could have stayed there forever, but eventually it was time to go down. I was very reluctant to leave; who knew if I would ever get a chance to come back? We walked down the slope on the opposite side from where we had come up. As we reached the bottom and looked back, the hill towered above us, partially in shadow as the sun had moved around behind it. It was spectacular. We went down across the plain between the hill and the river, and the wind was still racing. 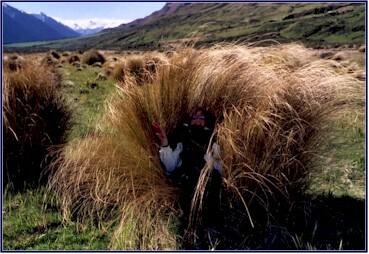 We noticed huge tufts of some sort of grass, tough but soft and fluffy; they stood as high as our heads. Jineen sat down in one of the tufts and lay back like she was in a recliner, and almost disappeared from sight! I tried it; the seat of grass was incredibly comfortable, and it completely blocked the wind; I could have spent the night there! We waded back across the river channels; only five this time as we crossed further downstream. 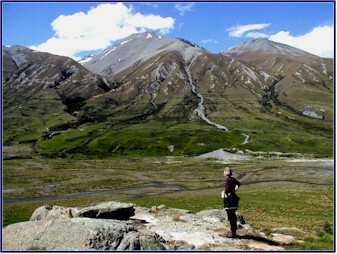 We changed into dry shoes, socks and pants; and saying goodbye to Edoras, we headed east and north. It was Sunday evening, and the roads were all but deserted. We had quite a long way to go, for we wanted to end up near the eastern coast for the night. Some of the areas we passed through showed towns on the map, but we never really saw them along the road; they were too small to notice, or perhaps we blinked at the wrong moment. After our late lunch on Edoras, we decided to skip dinner and just keep driving, but we felt we could use a little caffeine break and wanted to stop for a cup of tea or a coke; but in two and a half hours of driving we didn’t pass a single gas station or store! We ended up at Waikuku Beach, just north of Christchurch. We checked in to a very nice B&B there, the Emmanuel House, and the couple who ran it kindly gave us a cup of tea and some scones. We were tired and ready for bed, but very happy. What a great day it had been! Jineen and I both agreed that the afternoon on Edoras was probably the highlight of the trip. 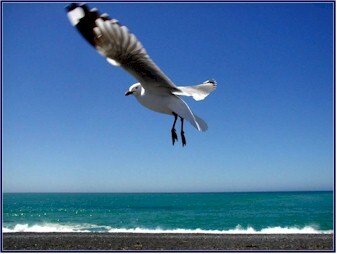 Once again, a beautiful sunny day; but sadly our last in New Zealand, as we would be flying home the following day. Our B&B host, Graham, was an older gentleman whose hobby was Ham Radios, he told us that there are 335 countries in the world, and his goal was to talk to all of them by radio; he only has 13 left to go! We also learned a bit about the Maori land controversy; I had read some about this, but it was interesting to hear more firsthand. When the Europeans settled in New Zealand in the early 1800s, predictably they gave the Maori people shabby treatment, although their plight seems perhaps not as bad as the Native Americans or the Australian Aborigines. Illegal treaties were made and not upheld, and the Maori people were relieved of most of their land. Now in recent years, the Maori have been taking the matter to the high courts, and they have been winning; they are being awarded much of their land back, or compensation for it. There is quite a bit of controversy over these actions; since it is land that was illegally taken from the Maoris in the first place it may seem fair to return it, but some New Zealanders are vehemently opposed to the compensation that is being given to them. Since our B&B wasn’t too far from the airport, we made arrangements to return there that night; one less thing to worry about later. We left our hiking boots drying on the front steps, and set out to enjoy our last day of the trip. We stopped at nearby Waikuku Beach, on Pegasus Bay. It was a serene sandy beach and hardly anyone was about; we stashed our shoes behind a bush and went for a barefoot morning walk along the edge of the Pacific. We stopped and talked to two men who were netting whitebait; these are tiny transparent eel-like fish that get fried up in patties, which to me sounds disgusting, but seemed to be a local delicacy. We saw a few people walking along the beach, and we met a beautiful collie named Claire, who looked like Lassie. She tried to tell us that little Timmy was stuck in a well, but we didn’t believe her. We headed north up the coast, and soon we were passing through wine country. We passed dozens of vineyards, but so far we hadn’t seen a single winery from which we had sampled the wares; we decided that we would have to remedy that on the way home! We noticed that there were fewer dead possums along this stretch, which implied also fewer live ones; perhaps possums don’t like to live near the beach. The road veered a little inland, and we passed through areas of farmland. Before long we were in the midst of the Hawkswood Mountains, though they seemed more like hills; how one’s perspective changes after seeing Mt. Cook and the Southern Alps! We decided that perhaps there weren’t really fewer possums living in this area, maybe they were just smarter ones. This could be the “Land of the Smart Possum”! Maybe they have Possum Colleges here, with courses such as ‘Road Crossing 101,’ and ‘How to get to the Other Side.’ The final exam is definitely Pass/Fail! The road returned to the shore and went along beside the ocean. Goose Bay was on our right and the mountains were on our left, often with steep rocky slopes coming right down to the water; the road passed through these by way of tunnels. As we passed through the Otumatu Rock Scenic Reserve, we spotted 5 dolphins, one with a baby, swimming in the waters just off of the shore; we watched them for some time as they cavorted through the waves. The shore was rocky with many little bays, and we kept a close eye out for seals, as they supposedly lived in this area. Presently, we saw something dark bobbing around in the water; it was a seal’s flipper! We stopped for a better look; and there in the water just a short ways from the shore was a seal, floating belly up, apparently dead, with his flipper sticking up out of the water. Just when we were feeling suitably sad and mourning the poor unfortunate seal’s untimely demise, he rolled over and splashed lazily in the surf; he wasn’t dead at all, but just napping! Soon we came to our destination, the town of Kaikoura; we were going whale watching! We went to the Kaikoura Whale Watch center, where we had reserved spots on their noon trip. We were a bit early, so we fed some bread to the seagulls, which were present in greater numbers than we had seen elsewhere; they would take the food from our hands while flying in place. It was a clear warm sunny day with a nice breeze; perfect weather for boating. Or so we thought! When we checked in, they told us that the seas were quite rough out in the area where the whales lived, and that there was a very strong seasickness warning for our trip. They went on to inform us that no small children, pregnant women, elderly, infirm, whiney, cowardly, or anyone who didn’t have a cast iron stomach would be allowed to go, or similar words to that effect. In fact, it seemed to us that they tried their best to talk us out of going! Undaunted, we swallowed a handful of Dramamine tablets and got on the bus. We had rented little bracelets that act on a pressure point on your wrist, which supposedly helps prevent seasickness. We were prepared! It was a five minute bus ride to the wharf; our only time on a bus the whole trip. Even though it was perfectly comfortable, we felt trapped and claustrophobic. We couldn’t imagine taking the bus tour as a way to see New Zealand! We boarded the boat and headed out to sea. It was a fairly large vessel; it had a cabin with big glass windows that seated about fifty. At first we were a bit disappointed to hear that we were not allowed outside of the cabin while the boat was moving, but soon we learned why. A very pretty Maori woman named Erenau was our tour guide; she gave us information about whales as the boat raced over the clear blue water, bobbing up and down over the swells. She also made sure to show us where the motion sickness bags were; there were at least three for each seat! Gradually the swells got bigger. Much bigger. The boat was leaping over the waves as it sped along, climbing the crests with ease then dropping down into the troughs with an unsettling thud. It was getting to be a wild ride, but really fun! We saw a dolphin leaping through the waves beside us. To avoid motion sickness we tried to keep our eyes on the horizon and let ourselves just move with the boat. The further out to sea we went the bigger the waves became. We were heading straight into them, and our boat climbed higher with each successive swell. Suddenly, a huge wave loomed in front of us; it looked like something from ‘A Perfect Storm.’ The front of our boat rose up at an alarming angle as we climbed the steep side of the huge swell; we teetered on the crest for an instant, before diving straight down to the bottom of the trough behind it. The passengers all gave a cheer; but the captain turned the boat around and headed straight back to shore! Our trip leader Erenau announced that due to deteriorating weather the trip was cancelled. We were given a full refund on the trip, but we were disappointed that we didn’t have a chance to see whales. But the good news was we didn’t get seasick! On the way back to the wharf, Jineen and I joked that maybe there really are no whales; the whole thing could be a scam to rent you motion sick bracelets and sell you Dramamine pills for $3 apiece! Since our quest for whales was unsuccessful, we turned our attention towards seals. We learned that about 20 kilometers up the coast was a seal colony, and we set out to find it. We arrived at Half Moon Bay and soon saw a sign for Ohau Point Seal Colony. We got out of the car and went down a little walkway to the viewing platform. There were seals everywhere! Some were swimming in the water or sitting by the edge of the shore, while others were lying quite high up on the rocks sunning themselves. 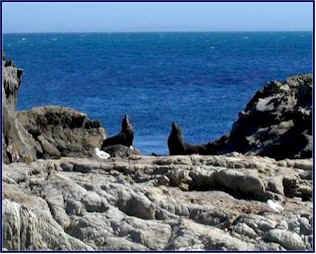 An information sign told us they were New Zealand Fur Seals. They were quite large; the bigger ones weigh up to 350 pounds. Wanting a better look, we climbed over the railing from the viewing platform and snuck down a steep little path to the beach. We were able to get quite close to them, often within 20 feet. 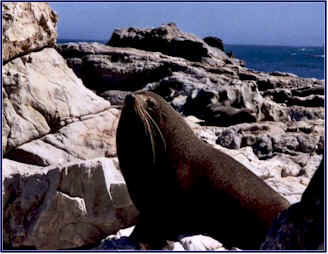 Seals were tucked into every nook and cranny, often concealed behind rocks or in crevices. We had to be quite careful climbing on the rocks; more than once we were startled by a hidden seal! If we got too near, the males would hiss and threaten us. 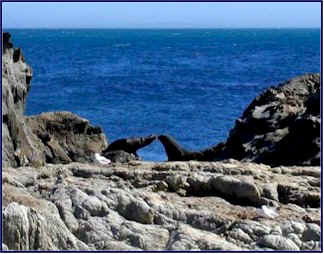 Jineen was cautiously backing away from a large seal that had appeared from behind a rock in front of her, when suddenly she realized that she had almost backed into another one; it was regarding her solemnly from a position by her right elbow! We learned an important fact. Seals stink! The whole area smelled pretty rank, we were surprised at how strong the odor was. I guess it was a mixture of seaweed and seal poo! 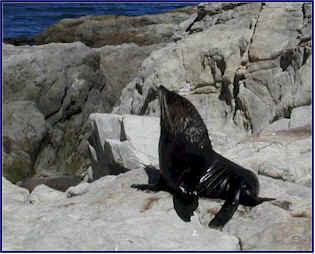 When they first came out of the water the wet seals appeared very black and slick, but after drying they would turn a grayish brown color that blended in with the rocks, and it was apparent that their fur was very thick. They have the most magnificent whiskers! They would sit on the rocks and scratch themselves with their hind flippers, like a dog scratching fleas. There was a colony of seagulls nesting in the rocks; quite a few of them were setting on eggs right among the seals, and they seemed to coexist peacefully. We also saw cormorants; these tall gangly birds were making nests on the cliffs above us. The seals all seemed to have very individual personalities. We watched the younger ones scampering in and out of the water and diving from the rocks. A pregnant-appearing female, very calm and lethargic, let us get within a few feet. One big male was laying belly up, sunning his stomach; he seemed to delight in staring at us and then wallowing on his back, showing off his family jewels. There were several very watchful big bulls; they kept a wary eye on us. If we got too close they roared, almost like a lion, and showed their impressive teeth; Jineen approached one to get him to pose in this threatening stance for a photo! We enjoyed spending the afternoon with the seals. We felt at least partially compensated for having missed out on whales! It was time to head back. 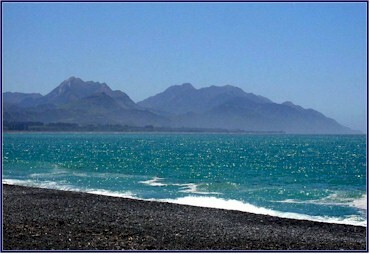 We stopped at a liquor store and bought a bottle of Kaikoura Sauvignon Blanc for later, and started back down the coast. Though the sky was still blue in the fading afternoon light, there was a haze in the air making the mountains in the distance seem slightly indistinct; it somehow added to the beauty of the evening. When we reached the town of Cheviot we took a scenic little side trip to Gore Bay, where we had a wonderful view of Cathedral Cliffs, a deep canyon with limestone cliffs eroded into an impressive display of fluted columns and pinnacles. We had an unpleasant revelation. The car smelled like seals! Perhaps we should have checked our shoes better before getting in. Driving south as the sun set, we realized that it had been a sad day for the Possum College students. We saw many of the flunkees by the side of the road on the way home. We had dinner at the Gateway Restaurant, where they served me a really bad steak; it tasted like the seals smelled. We returned to the Emmanuel House and sampled the Kaikoura Sauvignon Blanc, we gave it two stars. We repacked our suitcases and prepared for the trip home. The white stone, the greenstone and the red rock from Edoras remained firmly in my pocket. We were homeward bound. You know how when you go on a vacation and have a great time, and at the end of it part of you is sorry the trip is over, but another bigger part of you is really eager to get home? Well, that didn’t happen to me. I would gladly have stayed another month! We returned the Honda CRV to Rent-A-Dent, having put 2650 kilometers on it. That is 2120 dead possums! And that was just on the South Island, we hadn’t thought to keep track of our mileage on the North Island. We paid the excess baggage charge and flew from Christchurch to Auckland without incident. We thought our NZ adventures were over. That is, until we went to check in at the Air New Zealand counter in Auckland; that’s when we found out that our 4:20 pm flight had been rescheduled for 10:30 that night and they hadn’t informed us! This meant, of course, that we would miss our connection in LA by more than 4 hours! We were trying to straighten this out with the help of Stuart, a very helpful Customer Service agent. He was on the phone with the office in Sydney, trying to get us booked on a later flight from LAX to Dulles, when a loud siren went off. It was some kind of fire or security alarm; the entire terminal had to be evacuated! Eventually we got it all sorted out and boarded the plane for the long ride home. And with the help of the International Dateline, we got home before we left! Our trip was everything we had hoped it would be and more. New Zealand is a wonderful country. I can’t give it any higher praise than to say that it is a place that I would really like to live. And I will definitely be going back for another visit!